Looks very good and promising. I hope that screen is not needed to make it playable as I switch between MSX screen and GFX9000 screen on the same monitor. Such a fine game deserves support for a better sound chip imho. 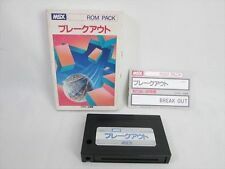 My guess is that most GFX9000 owners also own an OPL4 cart and/or MSX-MUSIC. 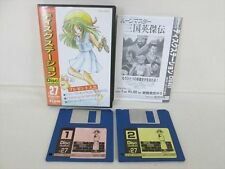 If you buy the game cart, do you also receive a rom file of the game? I prefer not to swap carts and just run it from my MFR SD. Thanks for the code. Actually we already thought of adding more scenes to the spaceship. It wasn't a priority at the time when the video was taken. It's now already added. 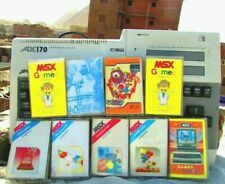 Sorry about the music, but our aim is to create a simple & classic shoot'em up for any MSX with 16KB RAM at least with just one add on... a v9990 VDP. We don't discard eventually to develop games with moonsound, fm ,scc ,etc. From my personal point of view, I really like PSG music (what's wrong with that though?) and I ought to say the current music is outstanding showing PSG really rocks. Please give it a chance ... I am sure nobody is gonna feel disappointed about that. The primary MSX screen is not gonna be needed to finish and play properly the game. Actually it's just a way to exploit both VDP's regardless it costs very valuable cpu cicles per frame, but we are trying to squeeze our beloved Z80. Game is probably gonna be just released as physical cart. We are actually tweaking the game because it's development is nearly finished... but we are not in a hurry. We want to release a high quality product. This game will not disappoint! Stunning graphics, great game play and story line and the music is definitely psg at its very best. I'm very tempted to order it right now Take your time indeed and enjoy! 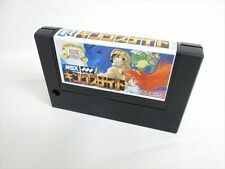 What a unique thing, an MSX1 cartridge for GFX9000 I love it! It will be released very soon. We're still balancing skill level, improving some FX, sounds and polishing plenty of stuff.